The company will join an exclusive group of Canadian cannabis producers that currently trades on a major U.S. exchange, including Canopy Growth (TSX: WEED) (NYSE: CGC), and Cronos Group (TSX: CRON) (NASDAQ: CRON) and Tilray (NASDAQ: TLRY), which trade on the NASDAQ. Recently Aurora Cannabis (TSX: ACB) (OTC: ACBFF) disclosed that it will begin trading on the NYSE with the symbol “ACB” later this month. Aleafia (TSXV: ALEF) (OTC: ALEAF) has filed its Form 40-F and intends to trade on the NASDAQ, while it is likely that CannTrust (TSX: TRST) (OTC: CNTTF) and HEXO Corp (TSX: HEXO) (OTC: HYYDF) will list on a major U.S. exchange as well. 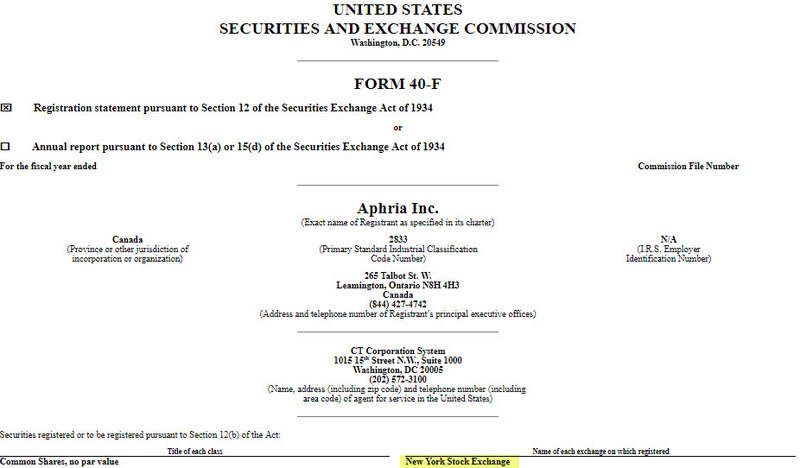 It’s not clear what trading symbol Aphria will use on the NYSE, but it won’t be “APH”, as Amphenol already uses that symbol.